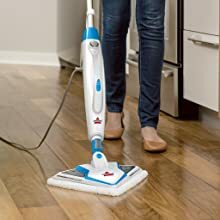 Take the power of steam where you need it and want it with the Bissell poweredge lift off steam mop. 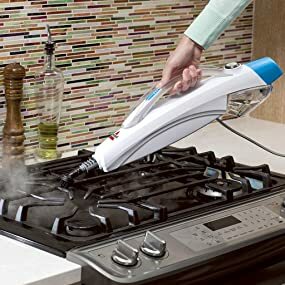 Easily go from steam cleaning your hard floors to above floor multi surface cleaning with the detachable handheld steam cleaner. 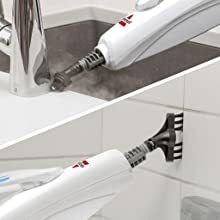 The portable handheld steam cleaner along with two specialized tools allow you to clean surfaces above your floors such as countertops, sinks, and dirt and grime from grout. 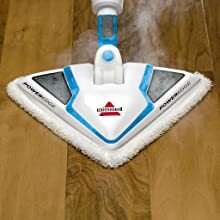 This steam mop is safe to use on your sealed hard floors such as hardwood, ceramic, linoleum, granite and marble. With steam on demand, you can dispense just the right amount of steam onto your floors. Plus, swivel steering and a triangle foot easily maneuver around corners and edges fro a quick steam clean. 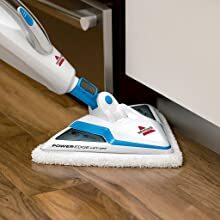 Clean with the power of steam both on and above your floors with the Bissell PowerEdge Lift-Off Steam Mop. The detachable, hand-held steam cleaner makes it easy to clean above your floors. Attach the grout tool to clean dirt and grime from grout. Use the bristle scrub brush to clean kitchen and bathroom sinks, countertops, stovetops, inside the microwave, oven, refrigerator and more.